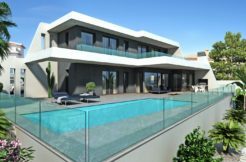 Fantastic seaview villa for sale in Calpe. Only 500m from the sea and from the nautic sports centre and her little harbour. Very nice ambience and good restaurants nearby. House on 3 levels. Plot IS 570m2. 4 bedrooms and 4 bathrooms (1 on-suite with hydro massage), kitchen, living/dining area, several terraces, pool and outside shower, garden, parking and garage. Close to Calpe town where there is lots to do. Perfect for holiday, letting or permanent living. Must be seen. Good quality materials. Beautiful seaviews and good sun oriëntation.